L3 Narda-MITEQ manufactures and designs a line of coaxial DC Blocks that can be used at the input or the output of the amplifier to prevent loading of the bias voltages. Together, coupled with L3 Narda-MITEQ's amplifiers, these DC blocks provide complete system balance, and boast both superior performance and reliability. These DC Blocks feature: ultra-broadband performance, low insertion losses, off-the-shelf delivery and compact designs. L3 Narda-MITEQ's DC blocks are typically used in the following applications: OC768 transmitters and receivers, general purpose test and measurement systems. 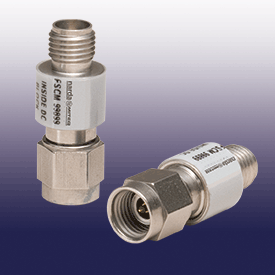 Some options are available such as custom frequency bandwidths and different connector outputs. 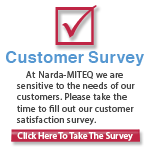 Since 1969, L3 Narda-MITEQ has been customizing to our customers specific requirements. This can include new design efforts, modifications to existing designs for performance and mechanical needs, as well as additional testing and environmental screening.